"Wishes and dreams do come true!" Valerie Rogers is the sponsor and producer of Bright Star Promotions teddy bear shows. "I believe in the stars, for they guide me as they have the sailors in their quest for new adventures." At a pre-show gathering at Weber's Inn in Ann Arbor, Michigan, Valerie was honored with a very special gift. 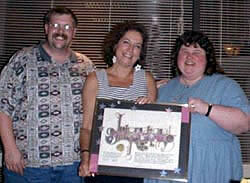 Kay Shepard of Shepard's Bears and her husband Dale, presented her with an unusual birthday gift. After Dale read a card they composed, (see below) Valerie was left speechless and delighted: A sparkling Star had been registered in her honor. It lies in the constellation of Draco (Quadrant's: RA 18th 57m 30s D 59 degrees 28') not far from the Little Dipper. "Now I can wish upon my own star," Valerie exclaimed. Dale and Kay said they wanted a very special gift, one that would be ever lasting, because "Valerie is more than just a friend, she is a mentor, mother figure, sister, dear friend, and we care about her deeply," said Kay. The International Star Registry's book will also be registered and copyrighted in the United States of America. A numbered star has been re-designated and named. Permanently filled in Switzerland, the star is named "Be Sure And Eat Your Green Stuff. " (Valerie always encourages everyone to eat healthy). "Dale and I also have a star, called: 'Commitment' honoring our commitment to our marriage and each other," smiled Kay. "For centuries the stars have been a great fascination for all of mankind. We gaze into the star-studded heavens and we wonder. As little children we learn to make a wish upon a star. As we grow we evoke our secret dreams on them. And hope they all come true. In a way we try to glimpse infinity. We look at the constellations as a symbol of possibility. We can only imagine that among them somewhere must be where God lives. Young lovers and old lovers too, kiss beneath the stars and the fascination continues. We point them out. We view them through telescopes. We paint them in pictures. We sculpt them in clay. We write them into poems and prose. We wear them on chains around our necks and top our Christmas trees with them. There are stars on Hollywood sidewalks. There are five pointed stars, the Star of David, skinny stars and there are chubby stars. Stars with long tails, stars with short points. Stars that tell sailors the way. Stars that burn bright, stars that fall in the night. And even stars that swim in the sea. But of all the wonderful stars, the one's that hang in the heavens and the ones that live on Earth, there is one special one who shines in our lives, and her name is Valerie. You are an inspiration, a shinning star. You keep us reaching, stretching, and hoping. You always have other best interest at heart. Showing love at every turn. For all you mean to us, we wish you a very happy birthday. And remind you to be careful as you travel along life's way, watch out for the other guy, and know that we love you, and "be sure and eat your green stuff!" 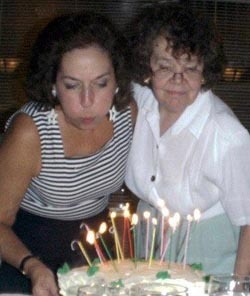 Celia Roberts looks on as Valerie blows out the candles on the lovely big star-shaped cake she made. Surprise! 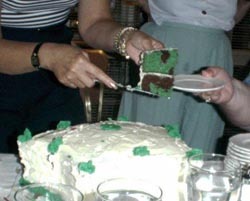 The cake is chocolate and green! "Now we can eat 'our green stuff'" said Valerie. Copyright © 1997 - 2017 Bright Star Promotions, Inc.